This is not your typical baseball hat. 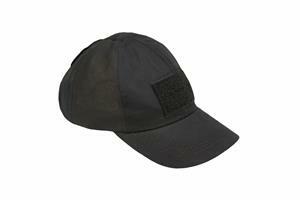 The Blended Operator's hat was designed to give you every possible option for comfort. The custom materials are lightweight for comfort and breathability. For increased breathability, 2 custom made side mesh panel were added to increase air flow. The under-brim is a non-glare black to shield your vision when shooting, this material is also hook compatible for attaching small bite lights. The typical top button has been replaced with a patch of female loop. Two large 2" x 3" loop patches are added to attach your own American Flag/ IR patches. Adjustable hook and loop closure. One size fits most.